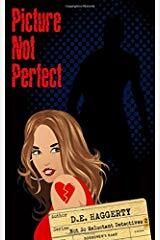 Today, it's my pleasure to have D. E. Haggerty as my guest to talk about writing PICTURE NOT PERFECT. Welcome to my blog. We all have busy lives. Although I consider writing my full-time job, I sometimes let life take over and writing falls to the background. During the past year and a half, that’s happened a lot as I was heading a non-profit volunteer organization. When that obligation ended (besides jumping for joy! ), I decided I wasn’t going to let other obligations get in the way of my writing. Nope! I was getting my writing done no matter what! That resolve was tested when our business in Germany ran into a huge hiccup. The managers left. (They also trashed the place, but that’s a different story – only to be told with a huge glass of wine in hand.) In addition to a week of renovations, we found ourselves driving to Germany every weekend. It’s a four-hour drive one way. Exhaustion once again became my middle name. But what about my writing? I’m pretty proud of the writing routine I’ve used over the years. I get up early (6 a.m.) and write for three hours. My goal is to finish at least one chapter a day. I average four chapters a week this way. As my books average around thirty chapters, I can usually finish an extremely rough draft in two months. But this routine wasn’t working when I was driving to Germany and dealing with the business there. It didn’t help that I was exhausted and emotionally drained. What to do? I’ve always considered myself more of a plotter than pantser. I keep a notebook for each of my novels and it’s full of chapter ideas and a general outline. But this general outline was doing me no good when I was constantly exhausted and being interrupted by the problems in Germany. And I didn’t have time to re-read what I’d already written before beginning to write again. Something needed to change. I decided my outlining techniques needed a re-work if I was going to keep my resolve to write even when life got busy. Instead of a general one-page outline for the entire book, I outlined ten chapters at a time. I also made an outline of the chapters already written with clues, romance, and red herrings highlighted in different colors. In this way, I could make sure I was sprinkling the various aspects throughout the novel. No longer did I waste valuable time re-reading chapters to get back into the story each time I managed to sit down to write. I also didn’t worry that I wouldn’t know what to write. I knew exactly what to write because my outline told me so! Using this improved outlining method, I was able to finish writing Picture Not Perfect in two and a half months despite spending a week in Germany as well as driving back and forth to Germany more than twenty times in those months. My goal for 2019 is to publish three books. How am I going to manage this? I’m going to plot and outline the heck out of every book I write. I’m already working on the outline for book 3 in the series now. Writing Picture Not Perfect was thus not only different than writing other novels, but I’ve also developed an entire new routine for writing. Thanks for joining us today and sharing your writing experiences. Here's additional information on Picture Not Perfect.